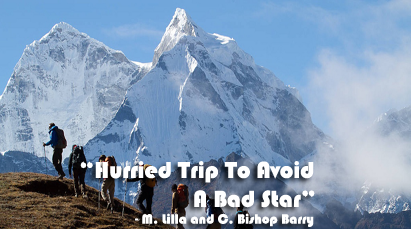 Hurried Trip To Avoid A Bad Star is an essay written by American Geographers M. Lilla and C. Bishop Barry. This essay present an exploration of Karnali zone of western Nepal on foot for 15 adventurous months. This essay was published as a visit report in The National Geographic as Karnali, 'The road less World of Western Nepal in 1971'. The writers in this essay describe the life account of Karnali zone people, their daily life, their tradition and culture, their lack of awareness about environmental preservation and Karnali zone’s economic dependency with the plain region of south Nepal. This essay 'Hurried Trp To Avoid A Bad Star' is based on the experience that the author had had while going to Nepalgunj from Jumla. They did this exploration on foot for fifteen adventurous months. After Christmas, they set out for the Terai to see how Karnali is economically linked with the lowdown regions to the south, especially Nepalgunj. Their fellow travelers carried medicinal herbs, hashish, hand-knit sweaters and blankets to trade in Nepalgunj. As they were climbing over Hari Lekh, a Chhetri woman of thirty overtook them and asked if they were going to Nepalgunj. She requested them to send her husband home if they found him in their village. They met a party of eight or nine men in a forest at 9000 ft. processing 'silajit'. When they were asked why they didn't process silajit at home, the people replied that they didn't have time to process it before because they would have fallen under the influence of bad star if they hadn't started a hurried trip. They then saw skeleton-looking Sal trees with scarcely a leaf left on them. When they asked the people about it, they expressed their helplessness saying they needed to feed their goats that very day. They were not much worried about soil erosion in the future as they had to live first. They reached the Terai. The fellow travelers bought sweet, cotton cloth, aluminium, ironware, spice and jewelry. Karma, one of the porters, bought things to make liquor so that he would earn much money. The people Of Jumla cannot survive merely farming; but they cannot leave the land either. Therefore, they have to do some other work to solve their hand to mouth problems. I would like to share few more Summary Collections from different sources to our generous readers, Enjoy ! The two American geographers M. Lilla and C. Bishop Barry (writers of this essay) present an exploration of the Karnali region which they did on foot for 15 adventurous months. After Christmas the two authors start their trip to know how Karnali is economically linked with Nepalgunj. Their fellow travelers bring medicinal herbs, hashish hand-knit sweaters and blankets in their baskets ~ to sell them in Nepalgunj. During their trip on foot, the two geographers see and learn many things about the life and culture of the people of Karnali region. On their way, a chhetri woman of 30 asks them whether they are going to Nepalgunj. According to her, her husband left her 15 years ago to find job in the plains the woman requests the authors to send him back if they find him. In a forest at 9,000 feet, they see some people processing Silajit sell it in Nepalgunj. Instead of processing it in their homes, they do it on the way because they have made a hurried trip to avoid a bad start. The people of the Karnali regions are superstitious as they believe that a bad star may have evil influence on them. They continue their journey, and notice some women cutting the branches of the ‘Sal’ trees to feed their goats. Almost all the trees have become bare. This shows that the people of Karnali zone are not aware of the possible environmental damage. They are ignorant about landslides, soil erosion, droughts etc. in the future. When the authors reach terai, they sit beside a campfire and listen to the night sounds of jackals, bats, mules and bullock carts. They walk on the paved streets and see the vehicles. Their fellow travelers or the people of Karnali region buy collon clothes, spice, jewelry, iron ware, aluminum and sweets to sell them in Karnali. The authors complete their exploration in Jumla. While they got back to the Terai region, the two American geographers learn a lot about the geographical condition and the life of people of the Karnali region. The authors observe all the seasons and the people who have been living in harmony with nature. They have been living very difficult life. As their cultivation can not support them, they have to involve them in trade. Some people go’to the plains in search of job. Thus, the people of Karnali zone are uneducated, conservative and they earn their living by the various traditional works. In this essay (Hurried trip to avoid a Bad Star), American geographers M. Lilla and C. Bishop Barry present an exploration of Karnali zone of western Nepal on foot for 15 adventurous months. This essay was published as a visit report in The National Geographic as Karnali, The road less World of Western Nepal in 1971. M. Lilla and C. Bishop Barry in this essay describe the life account of Karnali zone people, their daily life, their tradition and culture, their lack of awareness about environmental preservation and Karnali zone’s economic dependency with the plain region of south Nepal. With a view to study above mentioned aspects, the writers move to plain of south Nepal with the peasants (farmers) who were going towards Nepalgunj for their daily provisions. They were carrying medicinal herbs, hand knitted sweaters and blankets etc. to trade in Nepalgunj. While climbing step hill near Hari Lekh a Chhetri women of about 30 requested them to send her husband back home who left the house 15 years ago in search of job in the Terai. For this request revealed the concept of Karnali zone people about parameter of the world. In a Sal forest slope the writers noticed the chopping down trees from several direction which indicated the possibility of rapid deforestation in the region in coming future. On inquiry, the people explained their compulsion to chop down the trees to feed their animals, like goat,etc which exposed their lack of education and ignorance about the importance of preservation of environment. The writers noticed a group of 8 or 9 men in a forest processing 'Silajit' in order to sell in Nepalgunj. This superstitious people made a hurried trip from their home valley to avoid evil influence of bad star. On arrival in Nepalgunj the writers watched the hill people buying their daily provisions; one of them spent all his money buying distillery equipments with a hope to earn money by selling alcohol. The writers concluded their journey at Jumla. M. Lilla and C. Bishop Barry expressed their concern on lack of awareness on Karnali zone people about protection of nature and about the need of educating people regarding this vital aspect. They expressed that Karnali zone people were living in very difficult place with a very low agricultural production. The writers suggested them to involve themselves in trade with the Terai region in order to make their life easy with satisfactory earning. ‘Hurried Trip to Avoid a Bad Star’ is an extract from the article ‘Karnali, Roadless World of Western Nepal’ written by two American geographers M. Lilla and C. Bishop Barry. It gives a short account of the life of the people in Karnali. According to it, people in Karnali are peasant folks as in other parts of Nepal with the land which is not sufficient for their subsistence. Hence they are obliged to combine farming with other pursuits to survive such as selling silazit, medicinal herbs, hashish, hand-knit sweaters, blankets etc. in Nepalgunj. In order to make a living, they have to make constant movement to and from with their goods and animals over the dangerous paths of the region. People living in this part are quite innocent and superstitious. Some of the people form these parts go to Terai regions to find the work and return home after several years. Unfortunately, most of the people lack education to understand the value of the forest. On account of this reason, deforestation has been on the increase. They feel that they are obliged to depend on the forest area to feed their animals. If the forest continues to be destroyed at this pace, there will be no trees left in this part of the country for the future. American geographers M. Lilla and C. Bishop Barry in their essay Hurried trip to avoid a Bad Star present an exploration of Karnali zone of western Nepal on foot for 15 months. This essay was published as a visit report in The National Geographic as Karnali, The road less World of Western Nepal in 1971. The writers in this essay describe the life account of Karnali zone people, their daily life, their tradition and culture, their lack of awareness about environmental preservation and Karnali zone’s economic dependency with the plain region of south Nepal. With a view to study above mentioned aspects, the writers move to plain of south Nepal with the peasants (farmers) who were going towards Nepalgunj for their daily provisions. They were carrying medicinal herbs, hand knitted sweaters and blankets etc. to sell in Nepalgunj. While climbing step hill near Hari Lekh a Chhetri women of about 36 requested them to send her husband back home who left the house 15 years ago in search of job in the Terai. This request revealed the concept of Karnali zone people about parameter of the world. This may present some resemblance to a proverb popular among the Nepali people; something about a frog in a pond. In a Sal forest slope the writers noticed the chopping down trees from several direction which indicated the possibility of rapid deforestation in the region. On inquiry, the people explained their compulsion to chop down the trees to feed their animals which exposed their lack of education and ignorance about the importance of preservation of environment. The writers noticed a group of 8 or 9 men in a forest processing Silajit in order to sell in Nepalgunj.These superstitious people, with whom the writers shared the trip, made a hurried trip from their home valley to avoid some kind of 'evil influence' of bad star. On arrival in Nepalgunj the writers watched the hill people buying their daily provisions; one of them spent all his money buying distillery equipment with a hope to earn money by selling homemade alcohol. The writers finally concluded their journey at Jumla. They expressed their concern on lack of awareness on Karnali zone people about protection of nature and about the need of educating people regarding this vital aspect. They also expressed that Karnali zone people were living in very difficult place with a very low agricultural production and also suggested them to involve themselves in trade with the Terai region in order to make their life easy with satisfactory earning. The essay “Hurried Trip To Avoid a Bad Star” by M. Lilla and C. Bishop Barry is taken from the article “Karnali, Roadless World of Western Nepal” which was published first in the National Geographic 140.5 (November, 1971). It presents an exploration of the region which the authors did on foot for fifteen adventures months. The authors started their trek from Jumla to view how Karnali Zone is economically linked to lowland regions of the south, Terai. The fellow travelers from the nearby area carried baskets filled with medicinal herbs, hashish, hand-knit sweaters and blankets to sell in terai. When they came over the steep of Hari lekh, of about 11,350 ft, they met a Chhetri woman of 30. She told him that her husband had gone to terai in search of work 15 yrs ago but didn’t return yet. So as he seems from the distant village she told him to send her husband if he had been in those areas. Thereafter in an oak and rhododendron forest of about 9,000 ft they saw a group of eight or nine men working around a small fire processing silajit, from a tar like deposit which oozes from mountains in their home valley, Sinza. When asked why they hadn’t processed it in their home, they replied that they were under a bad star so they left their village and processed it on the way. According to them, they should do any work on a propitious day. That’s why, to avoid the bad star, they hurriedly made their trip at night. This portion of this essay gives its title. As they descended lower regions, winter gradually lessens. Their way passed through a saal forest where they saw skeletal looking bare saal tress with hardly few leaves left on few of them. They heard a chopping sound from all directions. They saw women chopping the left green branches and leaves for their domestic animals. When Barry described the prospects of deforestation to them, shrugging their shoulders they asserted that the cows must eat. This showed them that the mountain would be bare and eroded in a few years. Finally they reached Nepalgunj. There he saw all the fellow travellers were busy in buying sweets, doughy pretzels, machinery goods and ironware, spice, jewellery and distillery equipments. Looking at such the hardest way of life, the geographers appreciated the people. The agriculture yields only subsistence reluctantly. So they have to combine farming with other pursuits for which they need to make journey through formidable paths. To sum up the essay, it highlights how the people of Karnali zone are dependent on terai for their bread and basket because of the lack of trade, good market, employment opportunity, industry. They produce their food crops and handicrafts but there’s no market to supply it. They have to descend to terai for work. They have to come to lowland regions to buy basic goods for their life. Besides, the essay also depicts the predicament of the Karnali people showing their account of lifestyle, superstition, tradition and culture of thousand years old and simple human frailties set against the staggering backdrop of Himalayas at an altitude of 11,000 ft in the remotest mountain province of Karnali via plateau down to the plains of terrain, Nepalgunj. 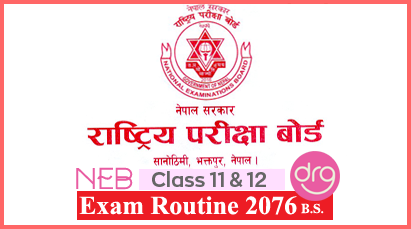 Class 12 Course "Hurried Trip To Avoid A Bad Star"
Summary Of "Hurried Trip To Avoid A Bad Star"
Summaries Of "Hurried Trip To Avoid A Bad Star"
0 Response to "Hurried Trip To Avoid A Bad Star | Summary"